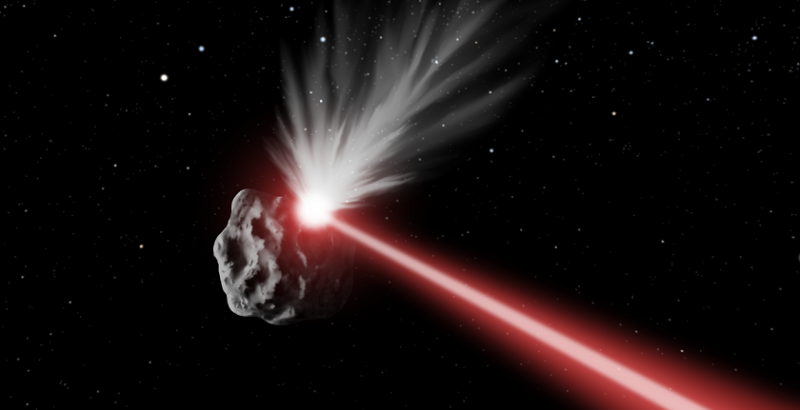 Could a laser weapon save earth from killer asteroids? Potentially hazardous asteroids are still looming large in the minds of scientists engaged in planetary defense issues. Numerous strategies describing deflection of near-Earth objects (NEOs) have been proposed, including methods employing kinetic impactors, robotic mining, and gravity tractors. However, one of the concepts has recently received attention as one of the most serious proposals. The project, named DE-STAR (Directed Energy System for Targeting of Asteroids and exploRation), envisions a large phased-array laser in Earth orbit to deflect asteroids, comets, and other NEOs endangering the planet. There is also a much smaller, though similar system being considered, called DE-STARLITE, that could travel alongside the target, slowly deflecting it from nearby over a long period. According to the authors of these proposals, their goal was to create an orbital planetary defense system capable of heating the surface of potentially hazardous objects to the point of vaporization. They emphasize that vaporization on the surface of an object continually ejects vaporized material, creating a reactionary force that pushes the object into a new path. This can be accomplished by lasers deployed on spacecraft stationed near the asteroid. The system should be capable of projecting a laser at a distant asteroid with sufficient flux to heat a spot on the surface and vaporize solid rock. Currently, high-powered lasers deliver sufficient energy density to melt and vaporize any known material. (a) Concept diagram of an orbiting DE-STAR engaged in multiple tasks including asteroid diversion, composition analysis, and long-range spacecraft power and propulsion. (b) Visualization of a laser beam with relevant physical phenomenon included at a flux of about 10 MW/m2. Credit: Kosmo et al. "Generally speaking, the technology is available today. The main challenge with building a full DE-STAR is the necessary scale to be effective," Qicheng Zhang of the University of California, Santa Barbara, one of the authors of the project, told Astrowatch.net. Zhang and his colleagues claim that if DE-STAR had a 330-feet-wide phased laser array, it could divert volatile-laden asteroids 330 feet in diameter by initiating engagement at about two million miles. However, DE-STARLITE, being a much smaller and less expensive system, is the more practical option. For instance, a 20 kW version of DE-STARLITE operating for 15 years could deflect an Apophis-size (1,066 feet) asteroid at a distance equal to Earth's diameter. A 1 MW version could deflect all known threats up to 1,640 feet in diameter with five-year laser activity. "The bigger the NEO, the longer the time needed. The bigger the laser, the shorter the time needed. With a very small 20 kW DE-STARLITE, a 300-meter-wide (1,000 foot) asteroid can be deflected in 15 years. Smaller asteroids can be deflected in under a year, after the spacecraft's arrival at the asteroid," Zhang said. According to the scientists, DE-STARLITE would be ineffective at deflecting targets on short notice due to the time required for transit to the target asteroid. Thus the DE-STAR system seems to be a last line of defense on short notice. A full stand-off system like DE-STAR is still considered as a possibility for the more distant future for its ability to rapidly respond to identified threats. It could also provide one of the few options for defense against long-period comets, which modern technology is often incapable of reaching by spacecraft. An orbiting DE-STAR of adequate size would have the capability of reacting to small or moderately sized objects that are discovered with limited time to react. However, the researchers note that actual effectiveness of a deflection mission depends strongly on the target. A mission optimized for one target may be ineffective when applied to another, even one of the same size and composition. "It depends on the exact circumstances. If, say, a 100-meter-wide asteroid were found today on a collision course with Earth next week, directed energy would not be a viable solution as that would require a very large laser array that would be far bigger than an equally effective single-use impactor or explosive. If, on the other hand, we find that same asteroid 30 years before impact, directed energy would be very effective, even with 10 kW lasers which are far below the power of many lasers in possession by the U.S. military today," Zhang explained. The concepts of DE-STAR and DE-STARLITE show that the directed energy method could be a promising technology for planetary defense. It could save our planet from small- to mile-class hazardous objects. With the recent technology advancements it is now feasible to consider the methods based on laser ablation as one of the most relevant and effective techniques of asteroid deflection. I wonder what is the chance of detecting a 100 meter wide incoming asteroid 7 days in advance or 30 years in advance. The latter variant may have some chance as the asteroid may be detected at a first passage near Earth. It would be extremely useful though to find them at least a week in advance. It would be extremely useful though to find them at least a week in advance. Agree, 7 days and not a day more. Party will start getting old past a week, and the hangover may ruin the last moments. Could an asteroid save Earth from a killer laser weapon? Most of these things are in the orbital plane or nearby. A radar ring around the earth a million Kilometers out to detect approachers and linked to an automated laser array behind the ring about, say 400,000 Km in a spherical array with 5 MW solar arrays feeding each member and accumulator banks of super capacitors to store and give an extra 'kick' would be nice. Protect against aliens too. Come to think of it, an alien 'menace', real or percieved, would be a great unifier of humanity. Put ALL of us on the same side, even the ISIS would help then. As Islamics they KNOW there ARE people out there that may not look much like humans. Given our barbarity to each other, aliens may consider us less like sentients and more like ..... food....... or at least something in the way of their taking our resources. The radar idea is worth exploring. A major problem with radars though is the received signal varies with distance as 1/r^4 (1/r^2 for both going and incoming signal). That means a radar tends to have a very short range, or it requires very good directivity. Also, the signal varies with the asteroid diameter as d^2, which makes 20-100 m asteroids difficult to detect. Current optical methods can find some of such objects 1-2 days in advance; some of them are detected when entering the atmosphere though. So asteroid detection is currently lacking sensitivity which is critical for evacuating an asteroid target area; that is the most probable approach for small incoming asteroids, since they are found too late. An increase in sensitivity is both direly needed and I think also possible with relatively modest investments. Currently, high-powered lasers deliver sufficient energy density to melt and vaporize any known material. Then there's the uncertainty about efficiency. Asteroids made up of materials that produce gas when heated? Easy. More solid chunks? Not so much. Rotating object? This will not work at all. 7 days in advance or 30 years in advance. A lot of these objects are in (eccentric) orbits of their own. So it's sometimes possible to detect then when they miss...and have enough time until they come again when they might hit. We need to put a giant "laser" developed by Dr. Parsons on the Moon and call it "The Death Star". It will be Phase II of our evil plan, otherwise known as the 'Alan Parsons Project'. When the Moon is in it's proper lunar alignment, zap, no more asteroid.